The lounge/dining area is approximately 20 foot by 15 foot. It has a laminated wood floor and alarmed French windows leading to the pool. The breakfast bar is open to the kitchen area. 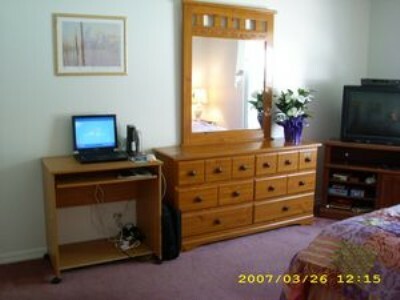 The room has a 28" digital cable television, DVD and CD players and two large, comfortable sofas. 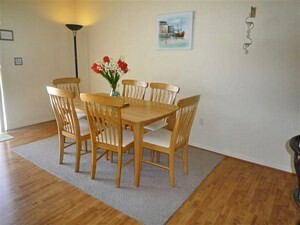 The dining area has a table that comfortably seats 6. All the other rooms lead off from the family room. The kitchen is approximately 16 foot by 12 foot with a breakfast nook by the window. 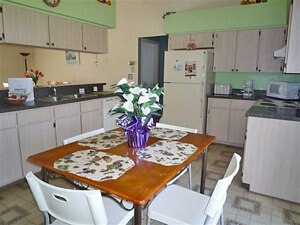 There is a large fridge/freezer, waste disposal unit, microwave, large cooker, toaster and blender. It is equipped with all the necessary crockery and cooking utensils. The master bedroom is approximately 12 foot by 14 foot. It is comfortably furnished with a queen bed, impressive dressing table, bedside tables with lamps, telephone and 28" digital cable TV. The window overlooks the pool. It has a large walk-in closet. 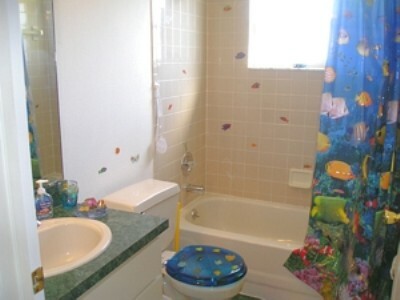 The ensuite bathroom has a walk in shower and twin vanity basins. There is an external door leading to the pool lanai. Bedrooms two and three share a bathroom with a tub and integral shower. 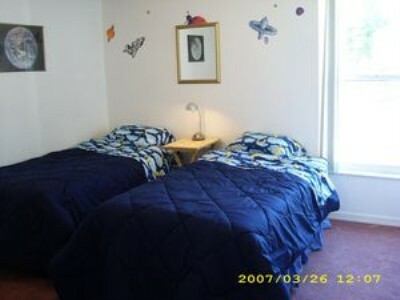 This is of a similar size to bedroom 2 but is furnished with a queen bed. It also has a walk-in closet, digital cable television and the window looks out on the front garden. 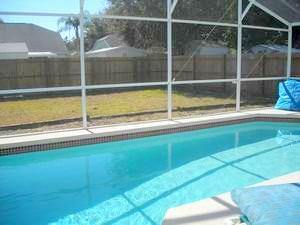 The pool and lanai are 21 foot by 34 foot. The pool is completely screened and is in an unusually large garden which is completely fenced in and, therefore, private and not overlooked. The pool deck is furnished with loungers, ottomans, chairs and a table with an umbrella. Briargrove is ideally located for several golf courses and is just 5 mins drive from the new Championsgate Resort Complex offering 2 Greg Norman designed golf courses, a supermarket to cater for all your needs and various food outlets such as McDonalds, Chinese, Subway etc. 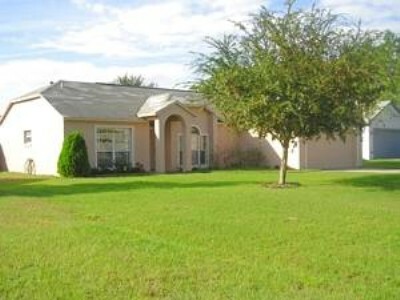 Only 5 minutes from the villa is Kissimmee which is located at the doorstep of Walt Disney World complex. The Kissimmee area also offers many recreational activities including golf, fishing, water sports, tennis, natural attractions, ecotourism and many other leisure activities. Many shopping outlets can be found on highway 192, also known as Irlo Bronson Highway, including Walmart.There are also restaurants of all descriptions and various attractions such as mini-golf courses, airboat and helicopter rides. 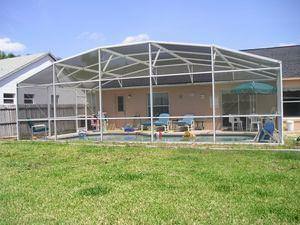 Other attractions nearby include Gatorland and Cypress Gardens. The historic downtown district of old town Kissimmee is located on Lake Tohopekaliga and features walking tours, antique shops, dining and sightseeing. Nightlife in Kissimmee includes Arabian Knights, Medieval Times and Capon's dinner shows not to mention downtown Disney. In addition to the attractions of Kissimmee and the theme parks, International Drive in Orlando and the night-life of downtown Orlando are only 30 minutes drive away.